Recently I've noticed some books appearing on my library shelf that have a great seek and find feel to them. Seek and Find books are always popular, but sometimes it can be hard to find something new after my kids have gone through all the Where's Waldo books for the hundredth time. These might be a bit easier than finding Waldo in a sea of people, but they're still a lot of fun! 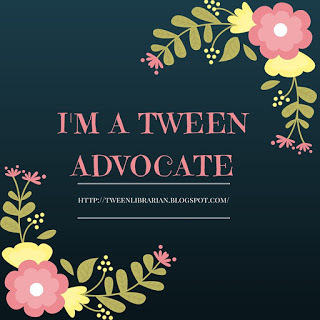 A delightful book that is perfect for a lapsit reading with preschoolers and up. 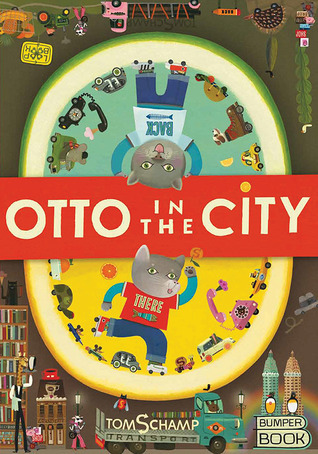 Otto and his dad are driving into the city and there's so much to see and do. This is more of a seek and find and look at the pictures book than a book with much plot or story. It's very reminiscent of Richard Scarry's Busytown books-(in fact there's even a nod to Richard Scarry and Huckle-see if you can spot it!) The fun part of the book is that there's so much to see each time you pour over the pages you're sure to spot something new. Then when you've reach the end, turn it around and head home with Otto. I love the suggestion on the back to follow along the path with your own toy cars-the oversized board book format makes it perfect for that and it's a great way to encourage storytelling in young readers. The illustrations might be a bit busy for some kids-there's a lot going on and it made me a bit dizzy looking at it all! But if you can handle a lot of motion and busyness in the pages, you're sure to have fun spotting the various characters, cars, and stores that pop up along the way. A young boy is looking for his pet dragon all throughout the city. This one combines a counting book with a search and find. I have to say that even though the dragon is huge and you would think he'd be easy to spot, I had to scan the pages to find him a few times! 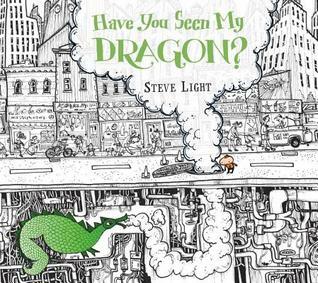 Steve Light blends the dragon into the illustrations so well that he becomes part of each picture-he's a fountain at the zoo or hiding underground. The books is done is pen and ink drawings and it's masterfully illustrated. The detail is fantastic. The book is drawn almost entirely in black and white and as the numbers go up, so does the number of illustrated items that are featured in color. I also love the illustration of the dragon breath coming up through the manhole covers as the author mentions in his bio that was what his father told him the steam was when he was a child. 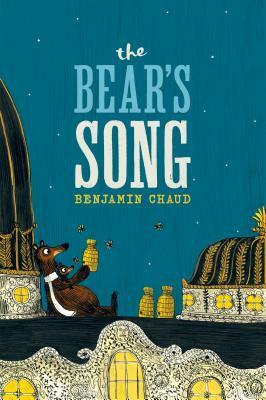 This is very creative book that is meticulously drawn and a great way to combine a seek and find format with counting.